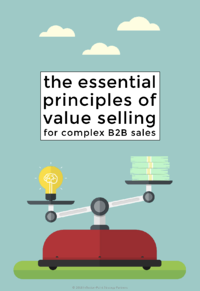 Our latest guide introduces the essential principles of value selling for complex B2B sales. Whether you're determined to implement value selling in your own organisation, or simply curious about what might be involved, this short e-book shares the lessons we've learned from helping hundreds of organisations put value selling into practice. The benefits include shorter sales cycles, higher average deal values, increased win rates and greater lifetime customer value. If you are seeking to achieve these objectives in your own sales organisation, why not REQUEST YOUR COPY TODAY?